Necrotic enteritis (NE) is an important enteric disease in poultry, caused by the overgrowth of certain Clostridium perfringens strains, which evokes intestinal tissue damage. In its acute clinical form, the disease is characterized by a sudden increase in flock mortality, and gross lesions that are usually, but not always, restricted to the small intestine. In the sub-clinical form, no peak mortality is observed, but intestinal damage will lead to decreased nutrient digestion and absorption, thereby negatively affecting performance parameters such as growth-rate and feed conversion ratio. Especially since the ban of antibiotic growth promoters (AGPs), the increased incidence of this sub-clinical form is estimated to have a substantial impact on animal welfare and on the profitability of poultry production. Aiming to test non-antibiotic alternative strategies to counter the negative consequences of NE, a research group at the University of Cairo set up experiments to evaluate the effects of butyrate in NE-challenged broilers. Butyrate is a salt of a naturally occurring short-chain fatty acid, and is known to trigger several physiological responses associated with improved gut health. Moreover, the product under evaluation (ADIMIX®Precision) was precision delivery coated; this means that butyrate is exceptionally well protected from complete gastric absorption, and will be delivered directly to the luminal side of the intestine, where it can be most effective in supporting gut integrity and reducing excessive inflammation. As such, it is predicted to support chickens in preventing and fighting NE. Briefly, 800 broilers were allocated to 4 treatment groups in a 2x2 factorial design: birds were supplemented with ADIMIX®Precision or not, and were either orally infected with a NE-associated C. perfringens strain right after IBD-vaccination (day 14), or were left unchallenged. After 35 days, birds that were infected with C. perfringens were significantly lighter than the control group, while their FCR was numerically higher (Fig. 1). In the challenged group, ADIMIX®Precision-fed birds outperformed the control group, with zootechnical characteristics comparable of those of the unchallenged birds. Importantly, also in unchallenged birds, supplementing feed with ADIMIX®Precision resulted in a significant increase in final weight and a reduction of FCR. Bacterial analysis of intestinal content at day 14, 21 and day 28 showed that the amount of C. perfringens was relatively variable over time, impeding a straightforward interpretation of the effect of ADIMIX®Precision on its ability to colonize the intestinal tract. Therefore, other potential modes of action underlying the observed performance enhancement were investigated as well. During the trial, a number of birds were necropsied and examined for pathological lesions of the small intestine. At day 21, necrotic lesions could be observed in all 10 birds examined (Fig. 2). 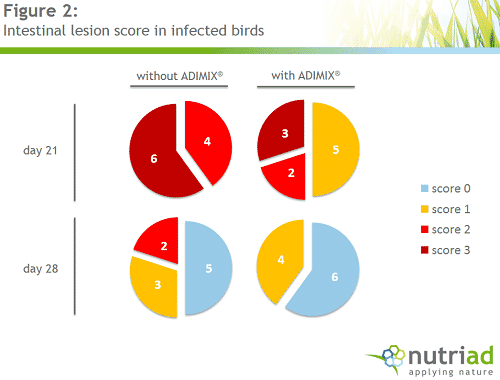 And although necrosis could be seen in ADIMIX®Precision-supplemented birds as well, lesion scores were less severe. And while one week later, scoring of the control group revealed that the birds were already partially recovering from the challenge, analysis of the ADIMIX®Precision-group suggested that intestinal recovery was faster in this group. 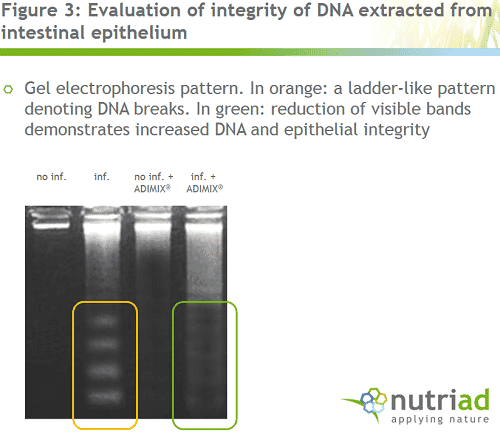 This finding was confirmed by another experiment, where DNA was extracted from intestinal epithelium, to evaluate its integrity via gel electrophoresis. While the epithelial DNA from infected birds displayed a ladder-like pattern on gel, this indication for DNA and cellular damage was much less pronounced in challenged birds that were fed ADIMIX®Precision (Fig. 3). Butyrate is also known to have anti-inflammatory effects and to trigger signaling in immune cells. In a last series of experiments, the researchers therefore investigated immunological readouts in the different treatment groups, such as bursa size and antibody response against Newcastle Disease vaccine. The bursa of Fabricius is a primary lymphoid organ that is involved in the differentiation of B lymphocytes and plays an important role in developing immunity. The relative bursa weight of challenged control birds was comparable of unchallenged birds, but was significantly increased in challenged birds that were administered ADIMIX®Precision (Fig. 4). 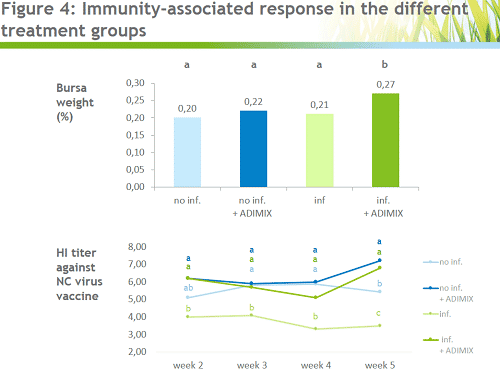 Results from a hemagglutination inhibition (HI) assay were suggestive for an ADIMIX®Precision-induced boost of immune responses as well: the HI titer against Newcastle Disease virus were reduced in NE challenged birds; on the contrary, birds that received ADIMIX®Precision had significantly higher titers. 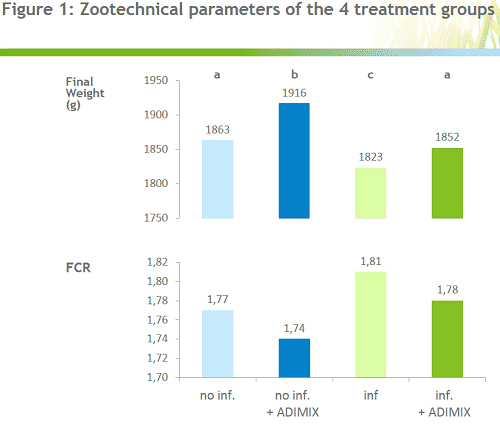 In summary, these results indicate that ADIMIX®Precision increased final weight and reduced FCR in broilers. Subsequent experiments suggested that these effects were at least partially explained by ADIMIX®Precision-triggered prevention or repair of intestinal tissue damage, and by stimulation of the immune response. Overall, these results demonstrate that ADIMIX®Precision is a non-antibiotic alternative that can be used to mitigate the negative effects of NE and to increase health and performance in challenged and non-challenged broilers. Tim Goossens, PhD & Daniel F. Ramírez, MSc.